Total Internal Reflection (TIR) refers to the complete reflection of light rays within an optically denser medium. Critical angle, c, is the angle of incidence in the optically denser medium for which the angle of refraction in the less dense medium is 90⁰. Light rays must travel from an optically denser medium to a less dense medium. The angle of incidence in the optically denser medium must be greater than the critical angle. i.e i > c.
Note that ﻿if first condition is not satisfied, we can forget about second condition﻿ because when light travels from an optically less dense medium to a denser medium, the light ray bends towards the normal. 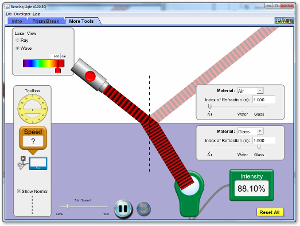 To help you understand Total Internal Reflection better, you can play with the applet below. Change the Materials to "Water" in first medium and "Air" in second medium. Switch on the torch light by pressing down the red button. You should be able to see the light ray is refracted away from the normal in Air Medium and a weak reflected ray is also seen. Now gradually move the torch light to the left, you should see the refracted light ray bends more and more away from the Normal until it disappears and a strong reflected light ray is observed. When this occurs, the light ray actually undergoes total internal reflection. To illustrate the first condition for TIR, now change the Materials to "Air" in first medium and "Water" in second medium. You should observe that refraction of light takes place instead of TIR even though the angle of incidence is greater than the critical angle. Optical Fibres are very fine, optically pure glass fibre through which light undergoes total internal reflection to transmit data from one end to the other. The loss of signal in optical fibres is less than copper wire.